On the occasion of the publication of Faith Wilding’s Fearful Symmetries, join Faith Wilding for an autobiographical reading from the book, followed by a conversation with artist and writer, and fellow feminist icon, Mira Schor. There will be a book signing post-event. 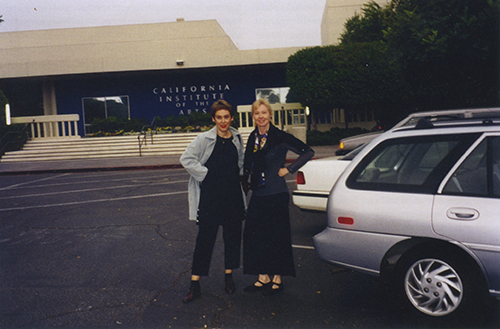 Photo: Mira Schor and Faith Wilding at CalArts during the F-Word conference, 1998. Mira Schor is the recipient of a 2019 Women’s Caucus for Art Lifetime Achievement Award for her work as a feminist painter, art historian and critic. The celebration kicks off with a ticketed cocktail reception from 5:30-7:00pm. Guests purchasing reception tickets will be treated to three food stations, butlered treats, an open bar, and the opportunity to congratulate the awardees. Immediately following the reception at 7:15pm the doors will open for unticketed attendees for the Awards ceremony in the NYIT Auditorium. The LTA Awards ceremony takes place from 7:30-9:00pm and is free and open to the public. The annual Women’s Caucus for Art Lifetime Achievement Awards is held during the Women’s Caucus for Art and College Art Association conferences.